There's a special kind of beauty in tactics games. Navigating the intricacies of battle and bringing your soldiers home alive is a unique thrill; half puzzle, half bloodbath. Fire Emblem Echoes: Shadows of Valentia excels in providing such thrills. Rich combat and a well-presented narrative drive a satisfying experience, even if it might be a little too bogged down by its many systems. 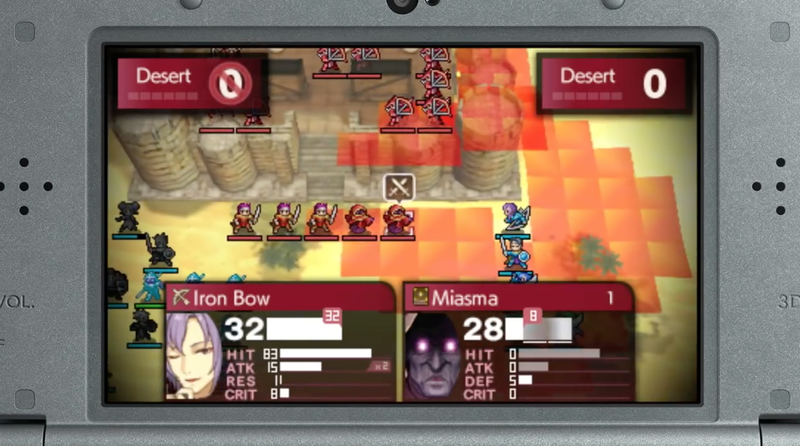 Echoes, to be released May 19th on Nintendo 3DS, is a reimagining of the 1992 Famicom game Fire Emblem Gaiden. 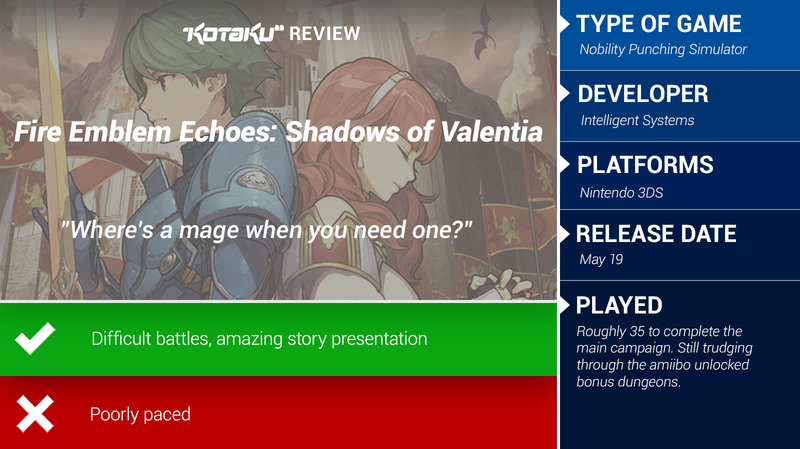 It repackages the basic narrative and strives to find a balance between older, more deliberate design sensibilities and the series' more accessible 3DS entries like Fire Emblem Awakening and Fire Emblem Fates. The end result is largely successful. The tactical depth arising from the reintroduction of older design elements leads to intense battles, while high-quality production brings the story to life. Players follow the tale of two characters in Fire Emblem Echoes. Alm is a wide-eyed peasant from a backwater village, while Celica is a devoted priestess. As children, they lived together in Alm's village before disaster and intrigue tore them apart. The two embark on separate quests that will change the world: Alm is thrust into leadership, becoming the figurehead of a populist army seeking to drive out invaders who deposed his country's king. Celica leaves on a pilgrimage to ask a powerful goddess to help rid the world of strife. You control both, leapfrogging between perspectives to see how one character's actions affects the other over the course of a grand war. Echoes' story presentation is astounding. The script is localised remarkably well, granting each character a unique voice that never feels forced or stilted. This is also the first 3DS title in the series with full voice acting. From main characters to incidental villagers, Echoes' story comes to life thanks to superb voice work from talented actors. The narrative, which adds additional scenes and characters not seen in Gaiden, weaves a tale of class oppression and courtly intrigue that manages to retain a human core. It never quite reaches the emotional breadth of Awakening or the all-out melodrama of Fates, but it remains captivating throughout thanks to the strong script and powerful voice acting. The core of Fire Emblem Echoes is tactical combat. Units are arranged on a grid and are then ordered around into individual skirmishes. Echoes uses many of the older mechanics from the series, and the combat tends to be better for it: Archers can shoot farther distances than the modern titles, units can't combine into powerful duos, and fatigue can set in to weaken characters who overexert themselves on the battlefield, leading to a decreased healthbar. There are more variables to track, creating a more in-depth, if occasionally overwhelming, battlefield experience. Archers can shoot from much further away than the modern entries in the series. Fire Emblem Awakening had a distinctly energetic feeling. Battles were boisterous, filled with massive critical attacks and excessive flair. Echoes is grittier, with an emphasis on defence. Units don't engage in clean battles. Fights are violent slogs reliant on terrain, magical vulnerabilities, and special items like shields. Victory is hard earned and it can sometimes take a great deal of effort to best even a single foe. I found that this makes success feel particularly rewarding, but it may alienate other players with its difficulty. If Echoes has a cardinal sin, it is poor pacing. The early game is slow, granting the player control over Alm and his comrades when they are little more than a gaggle of peasants. It takes some time before you can upgrade them into a cohesive army of archers, knights, mages, and mercenaries. And the endgame is punishing, with maps that funnel you towards overpowered villains and stack themselves with teleporting enemies and summoners who will continually spawn new foes. Only the middle of the game, full of character growth and developing abilities, manages to truly succeed. The game does give players a magical clock to rewind battles, but not even that can make up for some of the more lopsided difficult map design. As if to provide a counterbalance to the intense battles, Echoes attempts to diversify the player's experience by expanding how they interact with the world around them. Villages can be entered and explored in segments that feel a bit like visual novels. Players can speak to townsfolk to get a sense of the world, take small quests that offers useful rewards, or enter into a first person perspective to hunt for various items and trinkets. 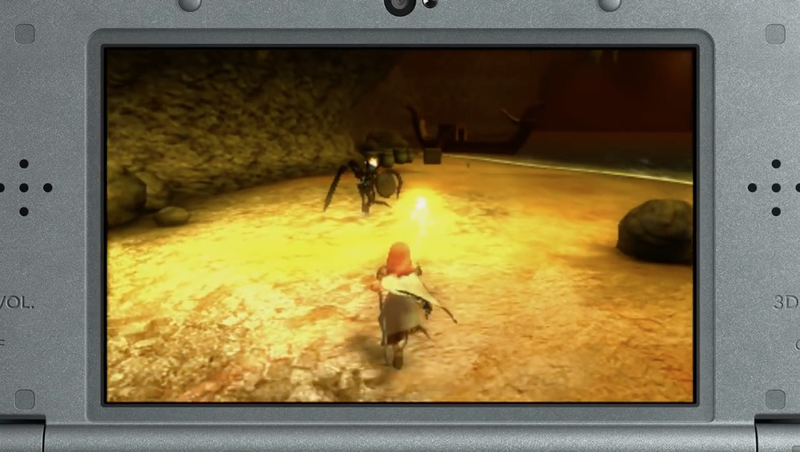 Ambushing monsters in the dungeon map will give you an edge during tactical battles. New to the series is the addition of dungeons. Alm and Celica will occasionally have to dive down into ancient ruins or enemy fortresses. These large explorable spaces split the difference between navigation and combat, working a bit like the dungeons in a normal RPG, full of treasure to find, shrines to pray at, and bosses to fight. Enemies wander the corridors, and attacking them will launch the game into a tactics battle. Managing your characters' fatigue is critical, and some dungeons may take multiple trips to completely explore. They're a bit sparse but provide some of the game's greatest challenges. Fire Emblem Echoes has many ambitions. It wants to be a difficult tactics game and it wants to tell a broad story of love and war. In the moment, it succeeds. It is only in the aftermath, after the war has ended and the corpses are cold, that the game starts to feel underwhelming. The game often feels caught between two extremes that it cannot fully reconcile. The combat, although robust, tends to frustrate and the story, although impeccable in presentation, doesn't quite feel as sweeping and romantic as previous titles on the 3DS. From start to finish, Echoes presents a gruelling experience. Its war is a brutal grind of bodies and mud. If you can endure the challenge, you'll find a satisfying mixture of tactics and story. Just don't be surprised if you're left with a few nasty scars in the process.